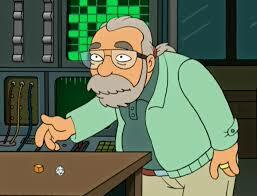 It’s hard to say when Gary Gygax affected me the most. I recall marveling over his alliterative name, wondering how it was pronounced, if it was real, and if it was, if he liked it. I thought ‘Gygax’ was cool, myself. It wasn’t any surprise to me then, when variations on the name popped up in supplemental material of that which his name will forever be attached: Dungeons and Dragons. The game of Dungeons and Dragons! What a life changing thing this was. It was huge when I was a kid, faltered when I got to my teen years, all but disappeared in my early adulthood, only to return with such force it will never be considered anything less than a great part of my existence to the end of my days. The game taught so much – I remember ‘negative numbers’ being brought up in math class, and I had already mastered them by playing D&D. I geeked out inwardly, because explaining ‘armor class’ to the girl sitting next to me would have been improbable. I remember creating a wooden replica of a bardiche for French class, in which I used the description in UNEARTHED ARCANA as initial template. I remember seeing the word ‘miscellaneous’ in one of the rule books for the first time, and loving the way it rolled off the tongue. To a young me, the name Gygax was elevated with reverence. Over time, I found I wasn’t alone. 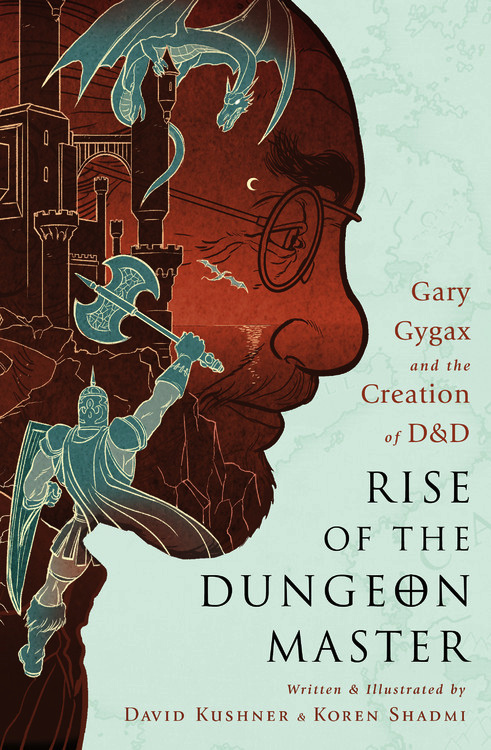 RISE OF THE DUNGEON MASTER: Gary Gygax and the Creation of D&D is a recent graphic novel release from Nation Books, a “leading voice in American independent publishing”. Written by David Kushner and drawn by Koren Shadmi, the book tells, in just 136 pages, the history of Gary Gygax and the development of the game that created a whole new industry. 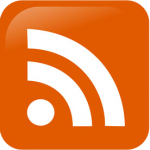 While truncated in the telling, as well as giving short shrift to Dave Arneson by excluding him on the cover, it does include all the basic important bullet points of the game’s development, as well as some poignant commentary from those involved. Let’s be frank: there are much more detailed books on the subject of Dungeons and Dragons. Kushner is more than aware of it, and utilizes the medium of graphic storytelling to the best of his ability. Due to the shortness of the book, it does allow the reader to work out his own thoughts on the telling, filling in the gaps between scenes and commentary. Shadmi’s art conveys all the necessary emotion, along with some rather amusing layouts that do everything to add to the narrative. The collusion of the two is unusually entertaining, as well as informative. As a comic fan, I loved the look of RISE OF THE DUNGEON MASTER. Its black and white shading actually benefits the art, making all the panels seem as if they’re actual snapshots of life. The writing is terse and definitive, pushing the reader to look for the more detailed works available. It has a conversational tone, partly reading as a recollection, partly as biography, partly as historical informative. It reads well. As a fan of games and a player of Dungeons and Dragons, the graphic novel was a tad brief. It hits all the touchstones and has some excellent moments that might not be found in other books of similar retrospectives, but it feels almost unfinished. For someone just getting into the history of gaming, or just the history of D&D and TSR, this is a primer, nothing more. RISE OF THE DUNGEON MASTER is a surprising addition to the legacy of Gary Gygax and Dave Arneson. It maybe puts a special shine on their occasionally contentious relationship, but it treats them both fairly, which came unexpected, considering the subheading of the title. It’s a quick read and may have a limited audience due to the subject matter, but for the resurgence in interest in the game, I believe it might find many, many hands to fill. 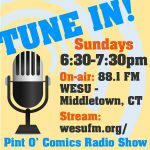 On the Sir Jon “beer-o-meter”, in which the more beers determine the amount of time and interest in reading a book, RISE OF THE DUNGEON MASTER rates a full four beers out of the six-pack. It’s got some depth, some thought and some moments of desired re-read, pushing the near completion of the sixer. A recommended read to all gamers and comic fans, as well as the casual student of history.